Cohn, B. A., Collin, S. P., Wainwright, P. C., & L. Schmitz (2015). Retinal topography maps in R: New tools for the analysis and visualization of spatial retinal data. Journal of Vision, 15(9):19, 1–10. doi:10.1167/15.9.19. 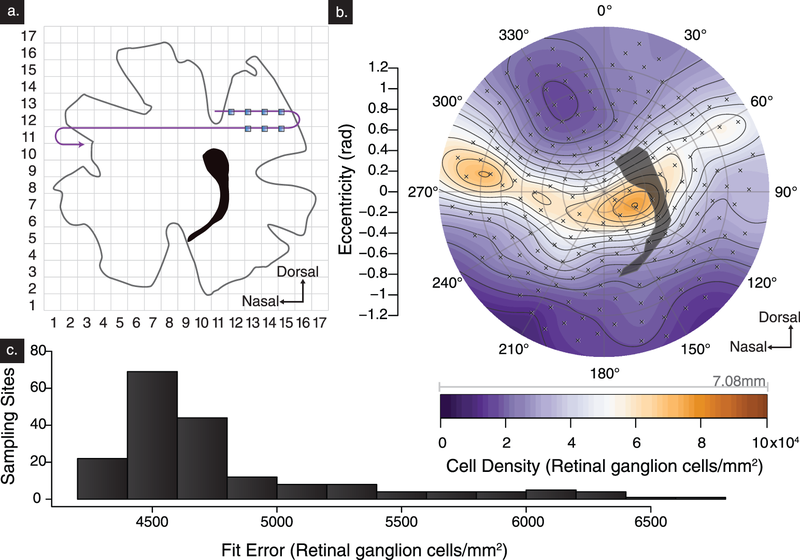 Retinal topography maps are a very widely used tool in visual ecology, as they summarize important information about the distribution of different cell types across the entire retina. These cells can be photoreceptors or ganglion cells, among others, and such cells have often very different densities across the retinal hemisphere. Humans, for example, have one very specialized area with lots of photoreceptors and ganglion cells, the fovea, whereas the peripheral parts of the eye have far less cells. Importantly, these high-density areas correlate with visual acuity. Other species feature very different distribution of cells in the retina, sometimes multiple peaks, or a streak, or a combination of different features. A good taste of the diversity of retinal topographies across vertebrates can be found here, with hundreds of examples. A major idea and research approach in the field of visual ecology is to link the diversity of retinal topographies to the lifestyle of organisms. And this is what I originally set out to do as part of my postdoc research with Peter Wainwright and Shaun Collin. Early on we recognized that comparisons between different eyes (be it of the same species or eyes from different species) wasn’t necessarily straightforward. Two major problems emerged: (1) the incisions required to flatten the eye cup in order to make a wholemount were never quite consistent; and (2) the reconstruction of topography, often done by manual interpolation, didn’t seem 100% accurate or objective. Obviously we weren’t the first to notice this. I’m not going to review the entire body of literature (we tried to do this as thoroughly as possible in the paper, but I want to highlight two recent contributions by David Sterratt and Eduardo Garza-Gisholt. ‘Retina’ is very easy to learn, and with stereology count data at hand, you can generate several maps per hour. Useful features include generation of average maps and a range of descriptive statistics that allow for a deeper assessment of the modeled map. An extensive tutorial with example data, and, of course, all code, is available on Github. If you would like more detailed instructions on how to use the software, please do not hesitate to contact us. If you are planning on working on retinal maps in the future, it would be great if you gave our software a try. We hope it will be useful! There are many aspects of quantitative retinal mapping that are understudied and any additional empirical study will be very helpful in moving our field forward. Please also let us know if you have any questions, concerns, and suggestions. Our goal is to further develop Retina based on feedback and requests from users. Specifically, what criteria are important for you when making retinal topography maps? What features of the current version do you like (or dislike)? This entry was posted in own research, R, vision and tagged acuity, computational biology, R, reef fish, retina, retinal topography map, visual ecology, visualization. Bookmark the permalink.